As anyone who has followed me here or on pistol-forum.com has to know, I’m a big fan of a technique called the press-out. So following up on last week’s “All or Nothing: Unsighted Fire” I thought turnabout is fair play and so I’ll examine the pros and cons of this technique and why it’s the right choice for some uses and the wrong choice for others. It basically moves in an upside down “L” shape. The gun moves in a straight line from holster to in front of the face, and then in a straight line to the target. This puts the sights between your eyes and your target as early as possible. It gives you a drawstroke that doesn’t rely on any practiced index and makes sure you don’t touch the trigger until you are absolutely certain that the sights are aligned exactly on the point of the target you want to hit. If you use a high ready position (as I do) it also moves the gun through that ready position, giving your practice a universal application whether you’re starting with the gun in or out of your holster. The gun drives straight from the holster to a fully extended position at eye level. It’s arguably the absolute fastest way you can make an aimed shot. The most common objection to the straight line draw is that it won’t work if there’s a steering wheel or table or any other obstacle that you’d hit with the gun as you swing it forward. There are two variants of that straight line draw. The first (which has been taught in defensive shooting classes since the beginning of defensive shooting classes) is to punch the gun out, then align the sights, and then make contact with the trigger to break the shot. Obviously, that’s a very slow process. Doing each of those things in sequence takes more time than doing them simultaneously (as in the press-out). Making the straight line draw fast relies on a practiced index — meaning the gun goes precisely where you want it every time you draw, literally bisecting the line of sight without any visual reference before the gun is fully extended — and, more importantly, a willingness to get on the trigger before you see your sights. Advocates of this technique usually discuss it in a competition context when the entire down range area is safe. If you had to shoot over the heads of a crowd of children in, say, a school shooting you’d be pressing on the trigger as the gun was pointed at those children. And in a match, you have time to think in advance about what you’ll do if there is an obstacle blocking your draw. The biggest challenge with the straight line draw is building up that perfect index. Plenty of people can do it to a big target like an IDPA or USPSA “A” zone at close range. Once you start applying the technique to lower probability targets (smaller, farther, or obscured targets) you see success requires a lot of practice. Otherwise, the gun is extended but not pointed exactly where it needs to be, taking time to get the gun and sights on target before the shot can be finished. Many of the people I see who can reliably hit the 3×5 card at 7yd during a F.A.S.T. run spend hours and hours every week practicing in dry fire on top of range practice. But if you can devote that effort to your skill building, and you can accept getting on the trigger before you see your sights, there’s simply no faster way to draw when you have the open space in front of you. Somewhere between the L-shaped press-out and the straight line draw is a decades old technique first described in Brian Enos’s book Practical Shooting, Beyond Fundamentals. It is essentially a J-shaped draw that moves the gun in a more direct path than the first option but gets the sights in front of your eyes sooner than the second. I think of it as rounding the hard edge between the “up” and “out” phases of the L-shaped draw. The Enos “J” draw gets the gun high enough to see the sights in your peripheral vision to verify that it’s pointed at the target before you start pressing the trigger, but doesn’t take the time to bring the sights right into the eye line. It gets the gun up high enough to avoid obstacles and allows you to judge if/when it’s safe to begin pressing the trigger. The “J” draw is still a press-out by my definition, but it’s one that literally cuts corners to deliver the gun at full extension faster. Because the shooter’s eyes aren’t looking through the sights as early as in the “L” draw, it benefits from the same index building practice as the straight line draw. After teaching and using the L-shaped draw for more than a decade, I am coming around to the J-shaped Enos draw. As a shooter, it allows me to avoid a sharp stop/start in my drawstroke, saving time as long as my rough index is good enough to get the gun close to where I need it before I see the sights. It also requires less bend in the elbow which is easier for me right now. As an instructor, it’s easier to teach because students don’t need to change the orientation of the gun from a muzzle up angle to flat and level. This saves not just time but also allows the student to skip over a conscious step that otherwise complicates the press-out technique. So which is best? Examine the good and bad and decide which works best for you right now, and keep an open enough mind that you can examine it again in the future to see if something else works better for you down the road. Bookmarked– thanks for breakdown different draw stroke styles. Interestingly one of the IDPA classes I attended strongly advocated the L draw. I prefer Enos’ “J” method. Can you talk more about when and where your trigger finger is and what it’s doing during the different draw strokes? Still working on those refinements. NWGlocker: I don’t personally use the straight line draw at all. 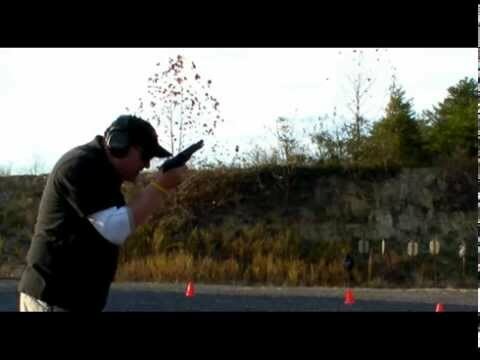 In my opinion there’s the safe way to do that (waiting until the gun is at full extension & sights are on target before touching the trigger) and the “competition” way of doing it (taking slack out of trigger as the gun goes from holster to extension and just assuming that gun is in a safe direction because the entire 180 degree downrange area is “safe” in the game). For the L-shaped draw, the steps I take are getting the front sight in front of my eye, then leveling the gun as it moves forward, and putting my finger on the trigger when I see the front sight through the rear sight (so long as my front sight is when I want it to be in relation to the target). For the J-shaped draw, I move my finger toward the trigger when I can see in my peripheral vision that the sights are on the part of the target I want to hit. I don’t start pressing the trigger until I have visual confirmation that my sights are aligned and on the target spot. The goal with both the “L” and the “J” is to have the shot break cleanly right as the gun reaches full extension. I use the “J” shaped draw, but until now I had not seen it described anywhere like this. Thanks for posting this info — it is useful. It seems to me whether you use the index or the type of L on the video< there seems to be no attempt to incorporate retention. While ok for competition it does not seem to be optimal on the street…or am I missing something? I think the L shape draw is absolutely incorporating retention. The closer the pistol is to the body the more power you have to retain it. Maximum retention power is approximately around the pectoral level-where most folks have their second hand join the grip and then “press out”. I don’t know of another way to retain the pistol better. Oddly on this one I think it is all or nothing between the draws… LOL. For competition I think the shooter should do whatever makes them reach their speed/accuracy goals. For self-defense if a person believes the often reported tunnel vision (loss of peripheral vision) it could make seeing the sights early in the J draw great in training but impossible when using it under life threatening circumstances. Thus making the J draw an inefficient/slow straight line draw or an L draw with no benefits. If seeing the sights early is the goal I suspect the best option is the L draw because the front sight is right there in the vision (tunnel vision or not). For me, once I sped up the L draw I found myself making the same slight adjustment when the index was off) at the end just like I did in the straight line but with the cost of time. For me, I believed in a life or death situation I was going to drive that gun from face to extension a little faster than I trained, thus having the same chance of needing that slight adjustment. I also didn’t believe that the L draw was more safe (But we beat that one to death previously LOL). So I switched back to the straight. To be fair, I learned the straight line draw first so perhaps it is not a fair comparison to a new student learning their first draw. Todd, do you believe new shooters can learn the different draws at the same rate? Does one take more practice time to gain the same proficiency? justonegun — I think the straight draw is definitely the easiest because it’s a pretty natural process. But I think it would have to be taught the old Gunsite way which was punch, then align sights, then contact the trigger. It’s pretty slow that way. If you are talking about reaching a point with an indexed draw then I’d say that takes more time and practice than the “L” or “J” draws, by far. The other two have more things to think about in terms of technique, but end up at a better solution IMHO. Yes I see it now…since its AIWB his hand is naturally further forward than mine coming out of a 3:30 position which locks my wrist into my side pec if I stay in retention. Could you do a quick video demoing the J draw? Thanks for the reply. It’s been years since I tried the L draw so memory did not serve as to how hard it was to make progress. I did the L press at AFHF. It didn’t work for me long term as index felt more natural and was faster….for me. I have seen Avery’s video and it is a great instruction. I would say I have my own version that is simply about drawing and hitting the target as fast as possible while being absolutely safe as possible. It’s not a L, not a J, not an index. More like a push to the target with a rise and a “ease to extension” the last couple inches or so where I am aligning the sights. I do find the L press to be unnecessarily slow IME, but as long as you can AFHF safely, it’s all good. When we consider only the speed at which we can find the front sight and fire a clean shot, we only need to find the fastest way to that. That’s why most competition shooters do the J draw/ presentation. Tactical/ defensive tactics will benefit from the things mentioned in the article by using the L draw. Personally, when I do tactical shooting, I present the way I always do. And that’s a small-arc J draw, almost a straight line with a slight curve from the moment the gun comes free of the holster until it stops at the firing point. I do a reverse, inverted L to go to high ready, then subsequently to reholster. In competition, I just do my “mini” J in both draw and reholstering. Perhaps the differences in holster designs used has also something to do with that. Good insights. Nice to learn something new every day. Now I will start “thinking” about my draw again.. It is not necessary, or even desirable, to get on the trigger early with a fast index draw. Getting on later reduces the chance of an ND, while also avoiding anticipation — as it makes the press one continuous motion rather than two parts. My testing shows that working the whole trigger press takes about .05 second more than working the trigger from a prepped wall, which seems insignificant in a draw — especially considering the safety benefit. GJM — Agree in principle if you’re going to use that kind of draw. But every time I see it demonstrated or see someone teaching it on video (and usually when I’ve seen it used in classes and matches) the shooter gets his finger on the trigger sooner than he sees his sights. Either you’re inside the trigger guard before you see your sights or you’re not. Great topic and discussion. I’ve never fully incorporated the “L” draw, even when I have been urged to use it inseveral classes. My natural draw is more “J” with a slightly elevated muzzle so the first thing that interrupts my line of sight to the target is the front sight. That provides confirmation that the shot is possible IF I need to shoot. That is not a consideration in competition, as the decision to shoot was made before the draw began. My context is as a LEO, so guns are pointed more than actually shot.